In this age of instant gratification, there is a corresponding increase in impatience. The ability to call up information in seconds, the ability to access virtually anybody through voice mail, email or text message, the ability to access money through an ATM machine or nuke something quickly in the microwave; these are just some of the many examples that bring the world to our fingertips in a second. So when things don’t appear instantly, people tend to get upset (for the best example, look no further than today’s political scene). Impatience is a form of anger, perhaps today the most common form of anger. Every episode of anger begins with an unmet expectation. Impatience is filled with unmet expecations. Experts refer to Americans as the “entitlement generation,” because by and large, we have such great expectations for immediacy, most of which come down to a selfish nature, all of which sow the seeds for stress, if we let it. Are you an impatient person? Do you have high expectations for how life is supposed to be? Do you get easily flummoxed when things don’t happed quickly? Do you tend to lose your temper at other people’s inability to do things quickly? Stop and take a look at your expectations throughout the course of the day today. Take time to fine tune your expectations. In no uncertain terms, patience is a virtue. While it might have been appropriate to have a photo of a someone banging on an ATM machine for their money, or yelling “Hurry up” at a microwave machine, I thought a relaxaing photo of Machu Picchu, with some Llamas might be nice to look at today. Enjoy! 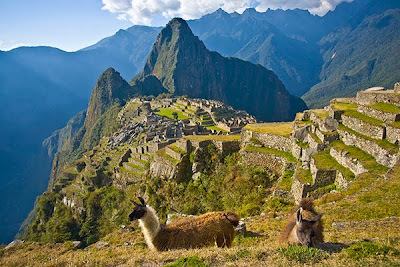 (By the way, it must have taken a LOT of patience to build this, not to mention the Inca trails to get to it. There are many types of stress. While much attention is placed on emotional stress these days, there are environmental stressors one should not ignore, specifically free radicals. In simplest terms, free radicals are oxygen molecules with an aberrant electron. We breathe these in quite regularly. In a perfect world, the foods we eat negate any harmful effects of these free radicals and all is well. When all is not well, the damage of free radicals in the body includes cell wall damage as well as damage to the DNA, RNA and mitochondria in the cell. The end result of such cellular havoc can range from cancer to heart disease (not to mention rapid aging) and much more. 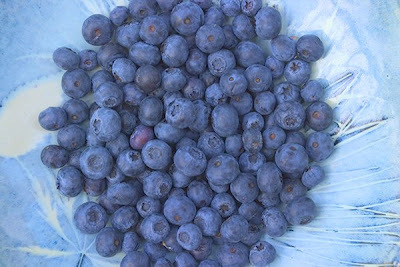 Many fruits and vegetables contain a wealth of antioxidants that destroy free radicals, thus promoting homeostasis (health) in the body. HOWEVER…today people’s eating habits are less than perfect. In fact, they are attrocious! To be clear about this, there are no antioxidants in ice cream, potato chips, doughnuts or tiramisu; in short junk food, processed food and the foods people often take comfort in when they are stressed. Is there a connection between poor eating habits and poor health? You bet! As we approach the summer months, the bounty of fresh fruits and vegetables is amazing! Consider shifting your appetite of comfort foods toward colorful fruits and vegetables (organic wherever possible!) Your body will thank you! Two books that should be on everybody’s bookshelf these days are 1) The Omnivore’s Dilemma and 2) In Defense of Food, both by noted athor, Michael Pollan. The information in these books will clearly change the way you see food and with any luck shift some of your eating habits in the direction of great health and longevity. Where there is stress, the ego is not far behind! Your ego is necessary for survival, afterall… it’s the ego that pulls the alarm for “fight or flight” when you are in physical danger. Metaphorically speaking, the ego is the bodyguard for the soul. It is the ego’s role to get you out of harm’s way. But today, few of our stressors are of a physical nature. Most are mental, emotional or spiritual stressors. Yet regardless of the source of stress, the ego acts the same way pulling the stress alarm, defending our thoughts, perceptions, attitudes, beliefs and opinions. Moreover, it lives (controls) by the motto, “If some is good, more has got to be better!” Remember, the ego is supposed to be the bodyguard, not the CEO! In the western hemisphere of the world, there is an expression that says, “Keep your ego in check.” In the eastern culture, one might here the expression, “Domesticate your ego (or you will have poop all over the place).” Never let your ego eclipse the light of your soul. Remember, the ego is not the bad guy. After all, ego is directly tied to self-esteem. Still and all, where there is unresolved stress, there is ego…pushing its agenda of control (which often times is an illusion of control where we often give our power away), thus perpetuating our stress. One reason why meditation is thought to help reduce stress is that it helps you observe your ego and thus learn to domesticate it. Every now and then, in the course of your day today, stop and listen to your thoughts. See if you can distinguish the voice of the ego, from the voice of your soul. Ego-based thoughts are often fear-based and negative. Soul based thoughts are affirming and lead you to your highest potential. Ken Wilber hosts an incredible website, featuring interviews with some of the most remarkable luminaries of our time. If you are a fan of Ken Wilber, then you already know this, but if you are not familiar with his work, this link is a good introduction to the man and his vision. Enjoy! Hawaii is a favorite place of mine to vacation and do photography. 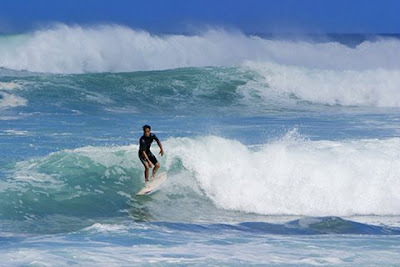 This photo was taken on the north shore of Oahu when the waves were reported to be some of the highest they had ever seen. Naturally, this made for some great surfing, which in turn lead to some great photography moments. Fear of the unknown can cause a lot of stress and in a rapidly changing world there is A LOT of uncertainty (e.g., the economy, job security or lack thereof, etc.) When the emotional stress response kicks in it is not uncommon to want to run and hide from fear (avoidance), or take on the “deer in the headlights” appearance—for days or even weeks on end. While the initial shock of change and uncertainty may be emotionally stunning, this modus operandi isn’t beneficial in the long run to cope effectively with stress. Taking a proactive stance is! There are literally hundreds of effective coping technique (and many ineffective ones as well). Information seeking is an empowering technique in which one tries to make the unknown know to lessen one’s fear. Knowledge is power and information must be processed well to become knowledge. As we careen head on into the information age, people have embraced this technique, however, there are caveats: Too much information can be as dangerous as not enough. A Google search is a great start for any information search, but don’t end there (not everything is on the web!). Talk to people who have experience. Back up your sources and try to validate your information. Turn your information into knowledge, and turn your knowledge into wisdom. What stressor are you facing that is rooted in the fear of the unknown? Where can you turn to for some additional information? These are questions to ask yourself as you work to resolve life issues both big and small. Do you back up your resources (get a second and third opinion?) Remember, its always a good idea to validate your information, even if its opinions about various situations so that you have a bigger perspective and a wider platform of insight. The Road Less Traveled, by M. Scott Peck didn’t take long to become a classic when it came out in 1980. Many books that hold ageless wisdom between the covers often merits a second read as we further down the road of our life journey. If you have this book, consider pulling it out and browsing through it again. If you haven’t read it, I highly recommend it. 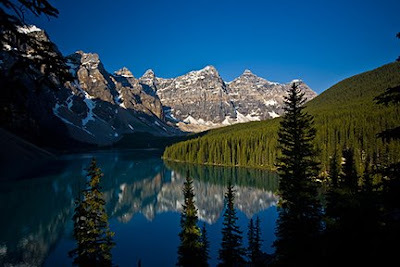 A pretty photo to start the week, this one was taken at Moraine Lake, near Lake Louise in the Canadian Rockies. Enjoy!